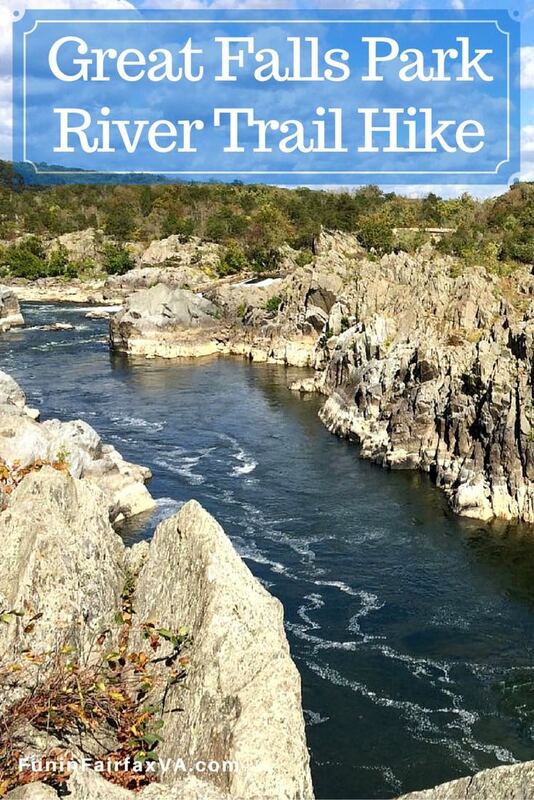 The River Trail hike at Great Falls Park in Northern Virginia offers some of the best waterfall and nature views near Washington DC. 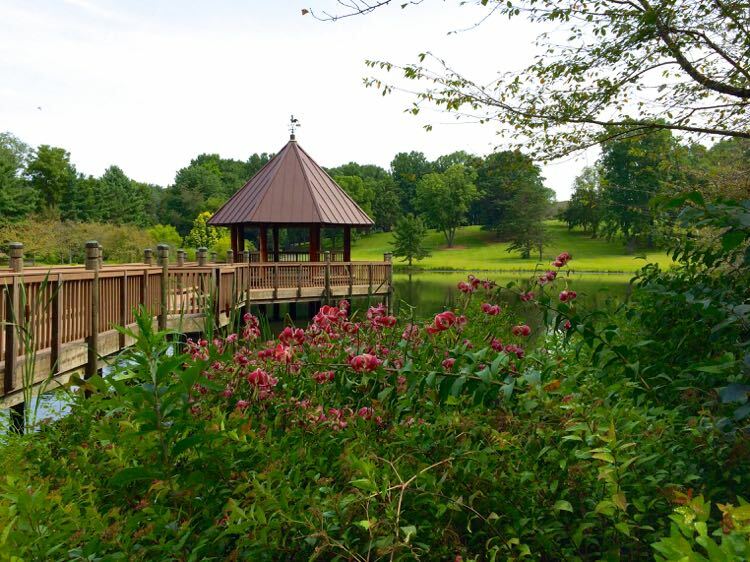 It’s a favorite place to impress out-of-town guests, but it’s also a great solo hike on a quiet weekday morning. The River Trail follows the Potomac River along the cliffs above Mather Gorge. 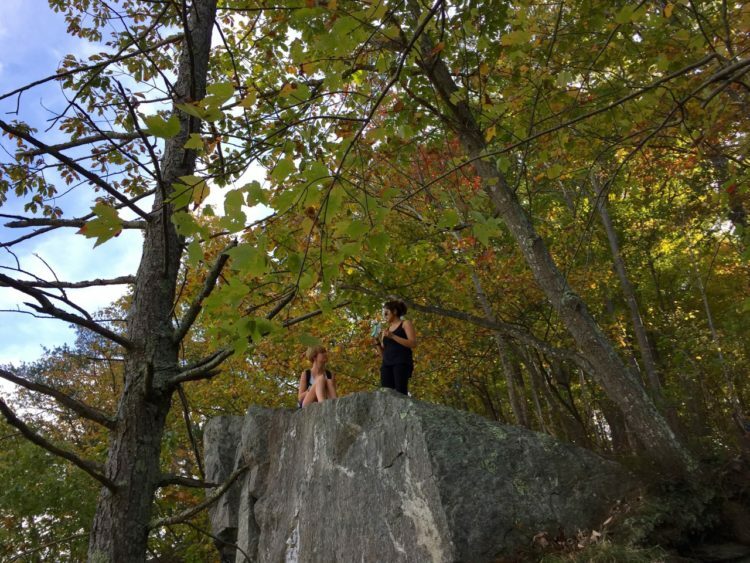 Hikers enjoy stunning views of both the Virginia and Maryland sides of the Potomac River. While the River Trail starts as a level dirt path, it quickly becomes rocky and narrow. 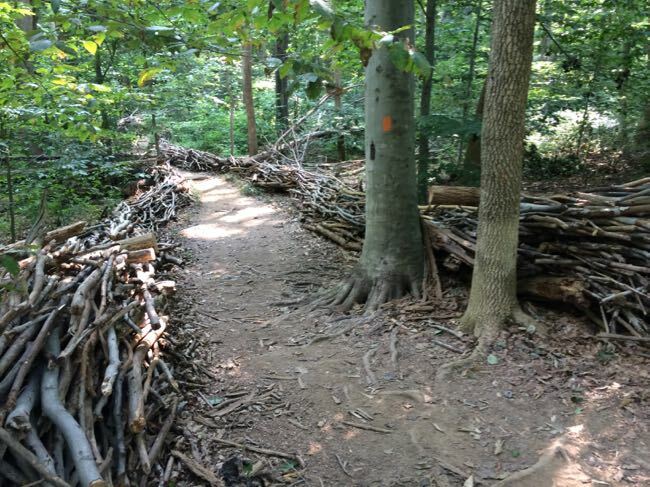 Several connecting trails make it is easy to create loop hikes of varying lengths and difficulty. 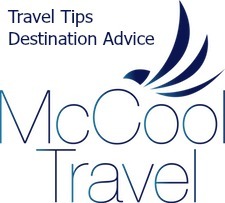 Wear comfortable shoes or sandals that can handle the uneven terrain. 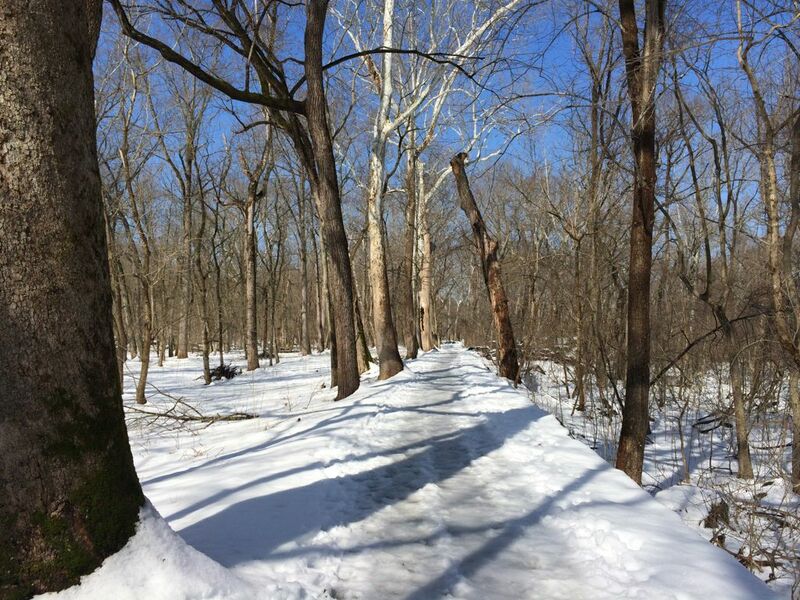 The trail will be muddy and slick after rainstorms, so opt for hiking boots on damp days. 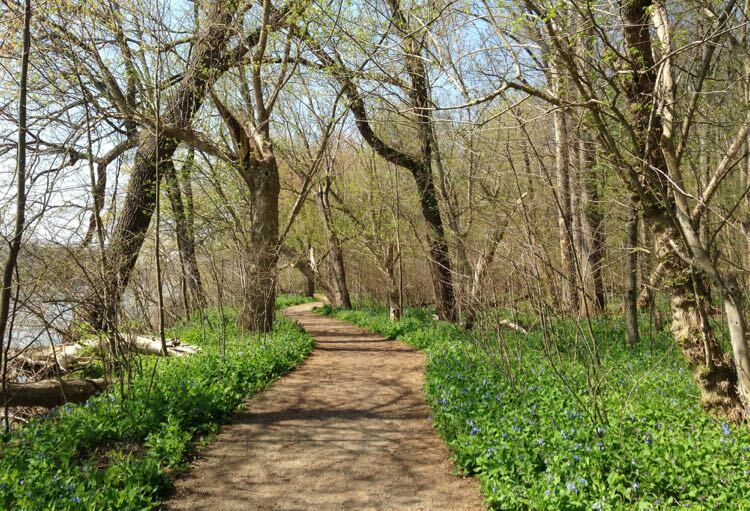 On any other day of the year, a River Trail hike is a beautiful outing that delivers a wonderful combination of views and exercise. The often rocky dirt trail is fairly level for the first mile before it descends to river level, then climbs steeply to a spectacular viewpoint. The trail is narrow and exposed to the cliffside in some areas, so keep a very close eye on young hikers. The blue-blazed River Trail begins just after Overlook 3 and the high water marker. 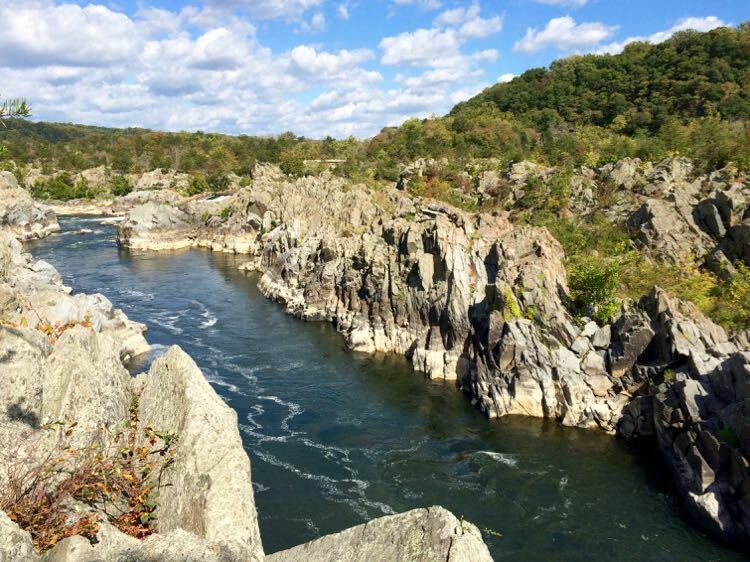 Visit each of the overlooks before you begin your hike for fantastic views of the waterfalls known as the Great Falls of the Potomac. All the water you see cascading over the falls is about to squeeze into narrow Mather Gorge. Pass the flood marker and bear left as you enter the woods. Hike to the Mather Gorge Plaque. 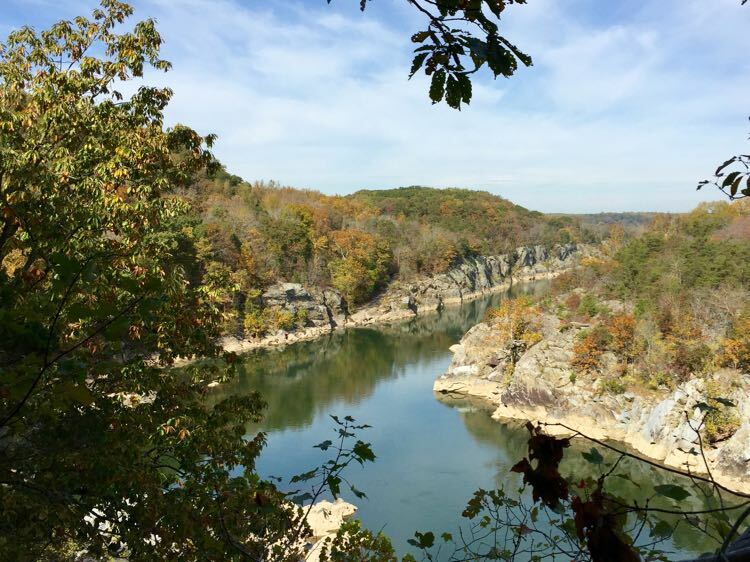 This popular and easy hike follows the River Trail until it reaches the plaque and a beautiful gorge overlook. 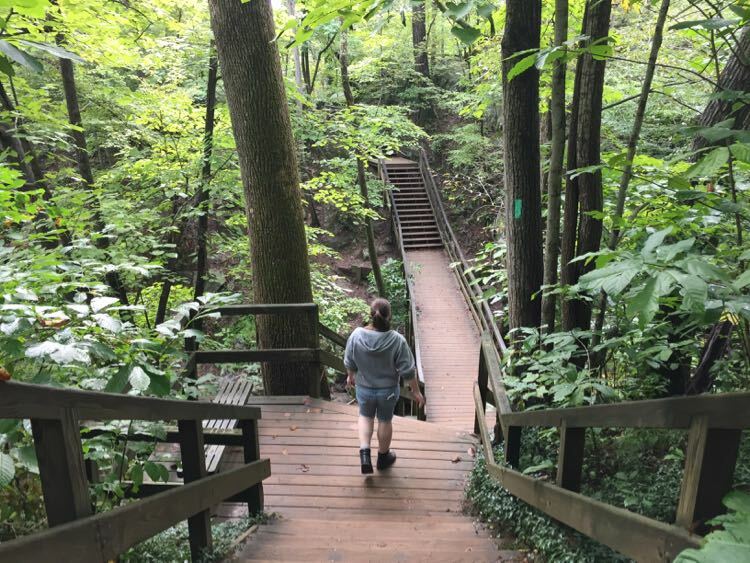 Enjoy the gorge view, then return the way you came, or loop back on the Patowmack Canal Trail for an easy 1-mile round trip. Continue past the Mather Gorge Plaque until you reach the paved road that leads to Sandy Landing. Return on the Mathildaville Trail, for a moderate 2-mile round trip. Continue past Sandy Landing to the Cow’s Hoof Rock viewpoint and return on the Ridge and Mathildaville Trails. This is a 3.5 mile round trip with some steep and difficult sections. 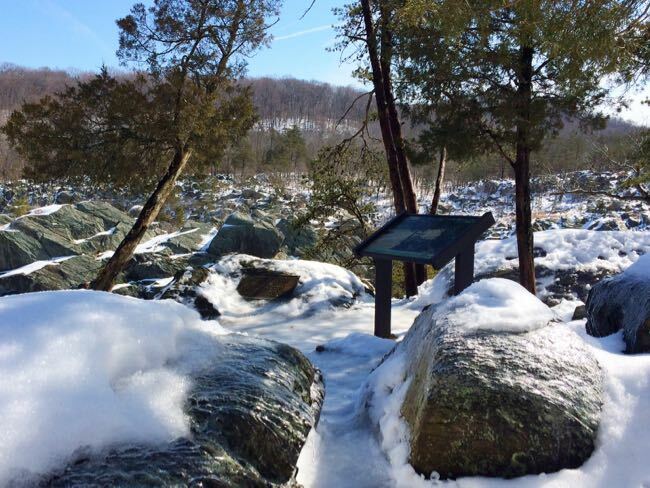 For most of the hike, you’ll be walking above the river along Mather Gorge. Carefully explore the rocks overlooking the river for beautiful views, but keep a close eye on any youngsters. The cliffs are high, steep, and dangerous. 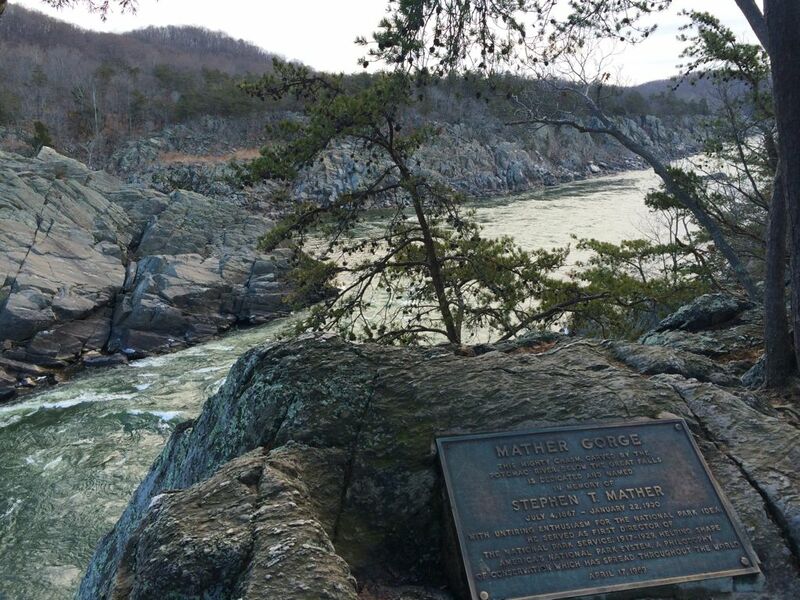 In about half a mile you’ll reach the Mather Gorge Plaque and another nice view. The view changes dramatically depending on the season and the amount of water flowing through the gorge. 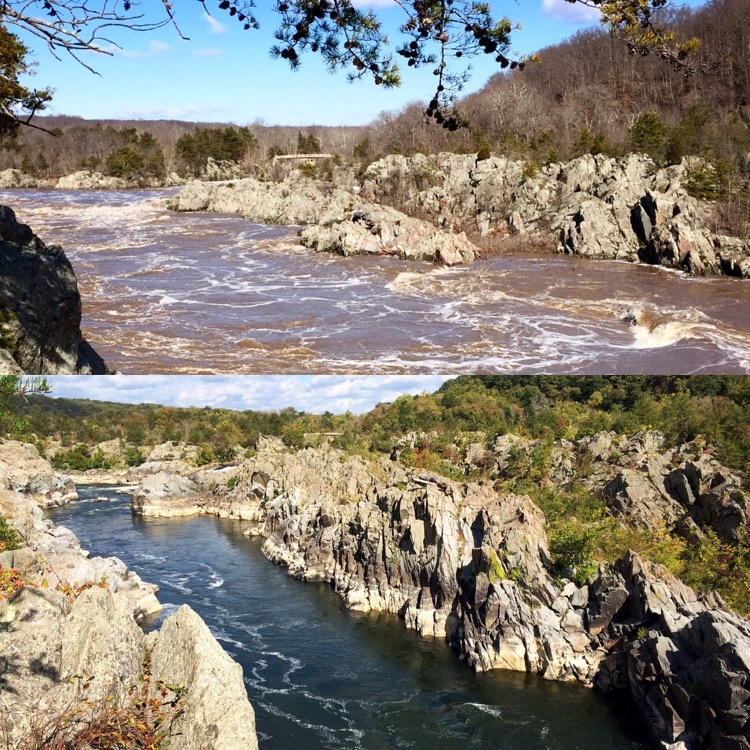 These photos compare water level in the same section of Mather Gorge in early winter and late fall. 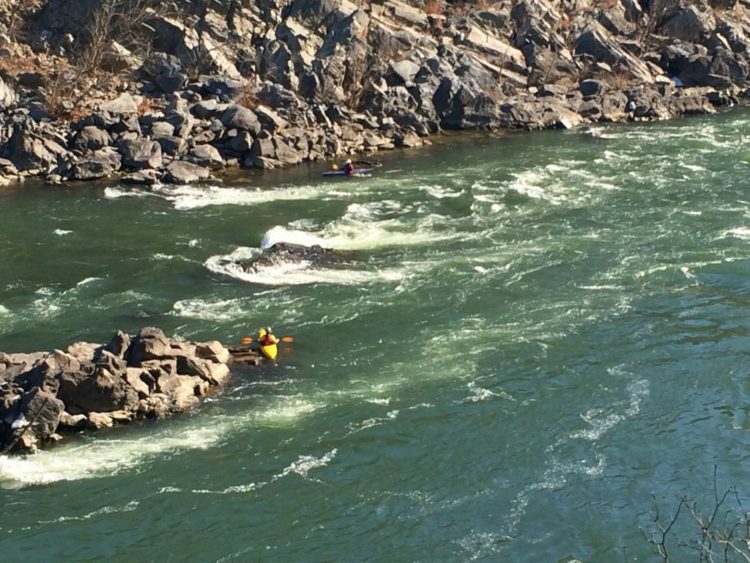 You will often see kayakers, and sometimes rafts, navigating the gorge from this area. Once we watched a helicopter flying through the gorge on a a training run. 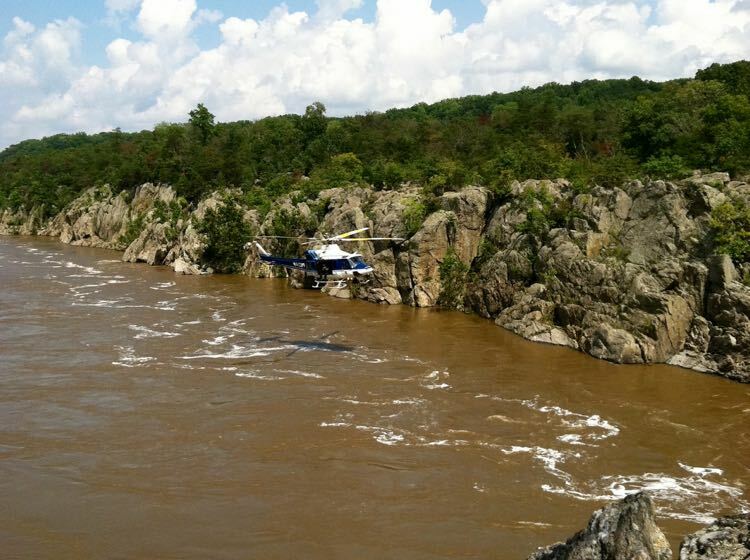 Sadly, there are several rescues and deaths every year in this section of the Potomac, where the current is often underestimated by fishermen, hikers, and boaters. The trail back to the overlooks is lined with trees, including beautiful sycamores with their mottled white bark. 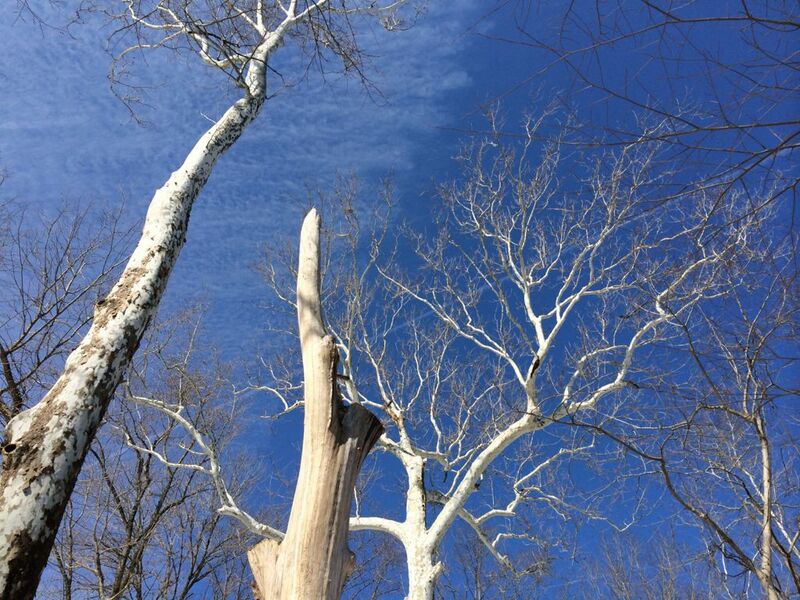 They look especially dramatic against a blue winter sky. If you want a longer hike, continue following the blue blazes to Sandy Landing. After the gorge overlook, the path crosses a pretty wooden bridge then continues along the cliffs. There are plenty of spots to stop for lunch and enjoy the view (carefully!). Soon, the path veers away from the river and crosses the Canal Cut, where the historic Patowmack Canal allowed boats to re-enter the river. Sections of the trail are rocky here. When you reach a paved road, you are at the Sandy Landing turn-around point. If you like, follow the steep, paved section down to the Sandy Landing emergency access point. You may be tempted by the water on a hot day, but stay out. The current is extremely strong and dangerous. It is illegal to even wade in the Potomac River at Great Falls Park. If it’s a nice day you’ll likely see people on the opposite side of the river. 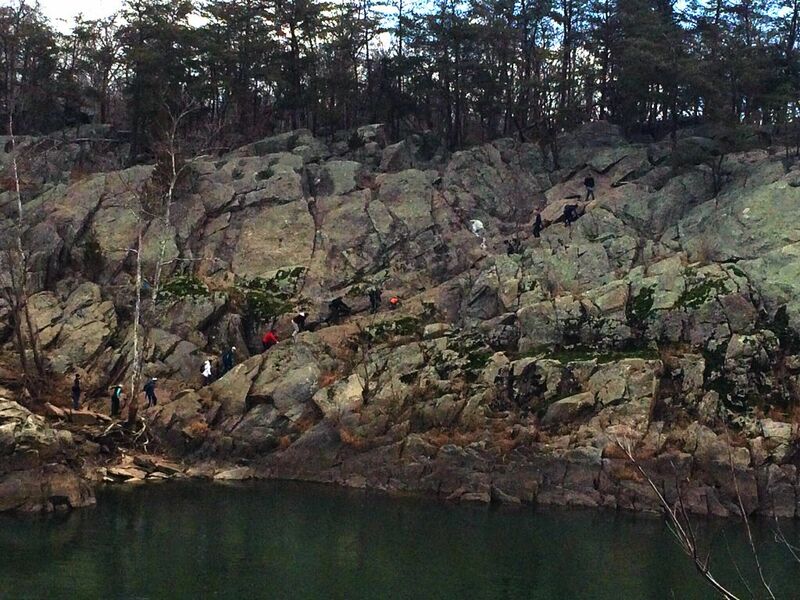 They are hiking the fantastic Billy Goat Trail from Maryland’s Great Falls Tavern. 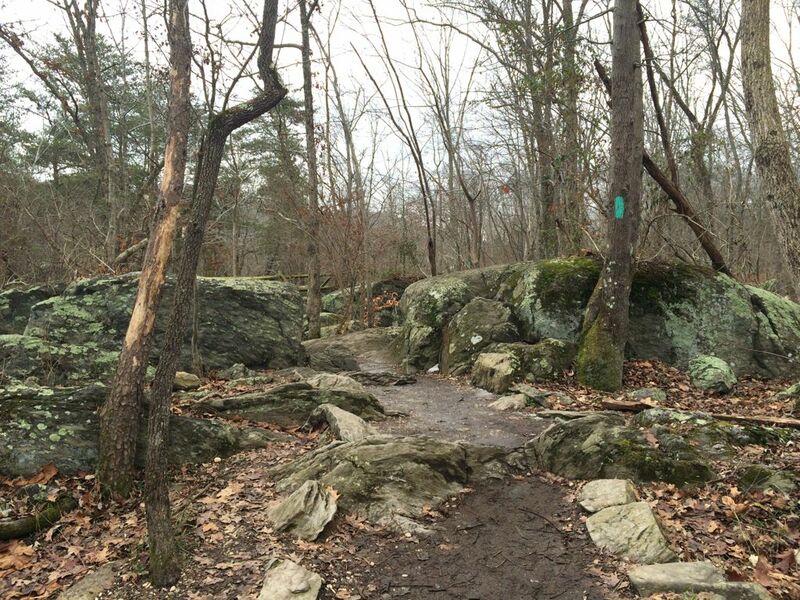 When you’re ready to head back, climb up the paved path to the trail marker and return on the Matildaville Trail. 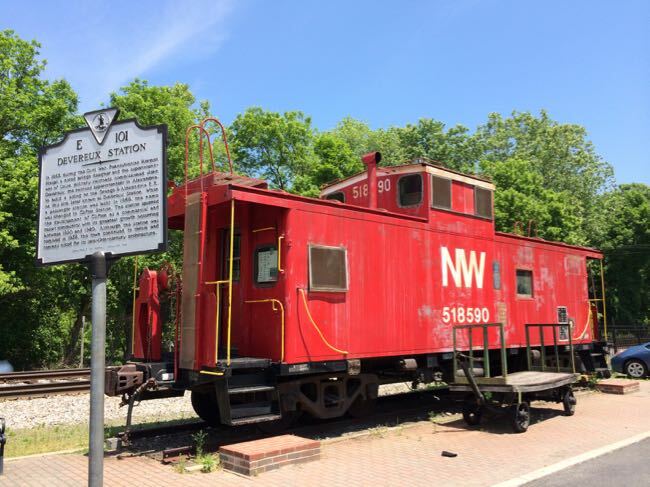 Matildaville was a small town that supported the workers who built the Patowmack Canal. 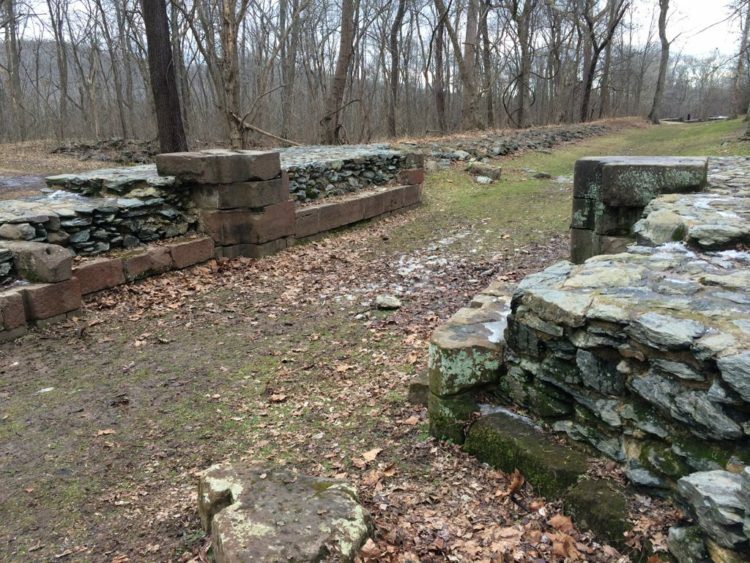 You can see ruins of the small settlement on your return hike. The River Trail hike gets much steeper after Sandy Landing. First, the trail descends steeply downhill until you are almost even with the river. You’ll pass the remains of a fireplace before climbing steeply uphill again. Watch for the large rocky viewpoint to your left known as Cow Hoof Rock. This is a great place to stop for a break and to soak in the view. If foliage blocks your line of site, climb down the trail a bit to the next rock outcropping. Cow Hoof Rock sits above a bend in the river, with a dramatic view back toward Mather Gorge. When you are ready, continue up the hill to the next trail juncture, and turn right on the Ridge Trail. Turn right again on the Matildaville Trail for a shady, wooded hike back to the Visitor Center. 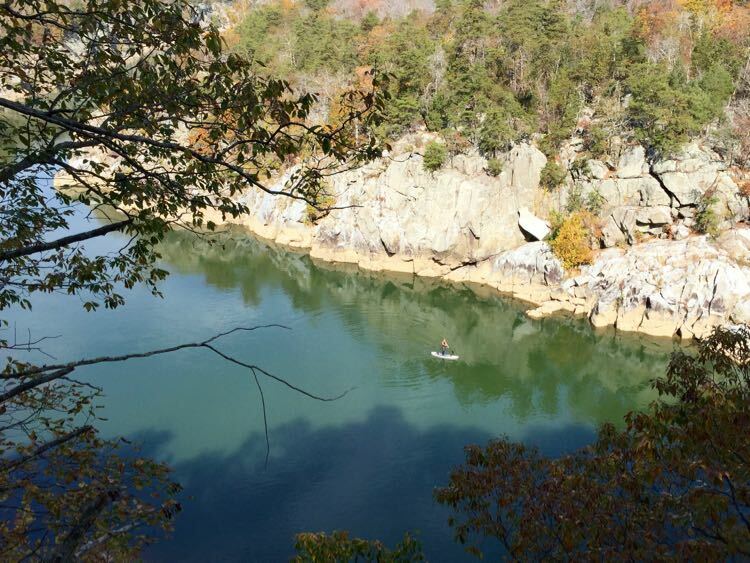 Hiking is just one of the activities you can enjoy at Great Falls Park. 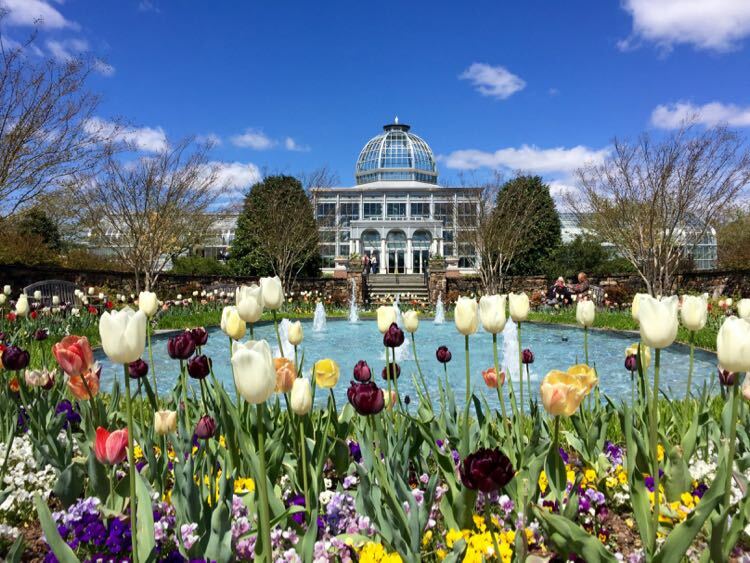 Read our complete guide to fun things to do in Great Falls Virginia for more activities and tips for your park visit. 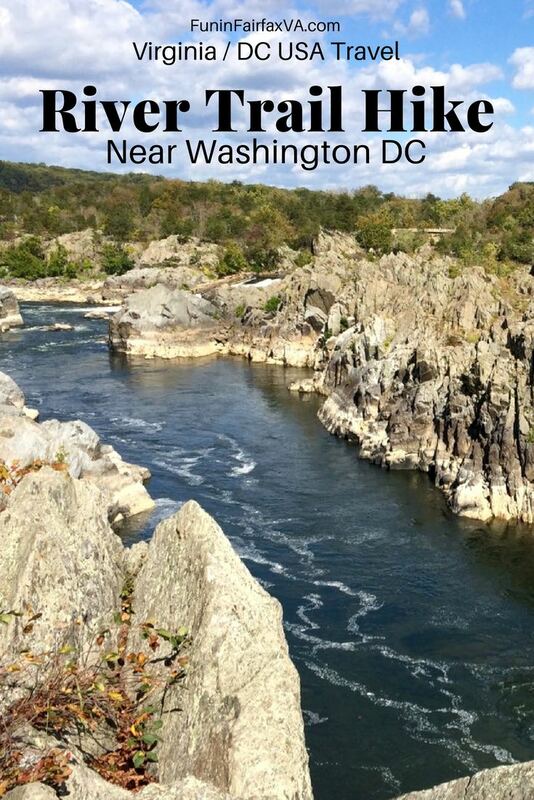 Admission to Great Falls Park is $20 per car, but you can enter free with a National Park Pass. Wait times to enter the park can reach an hour or more on busy weekends. 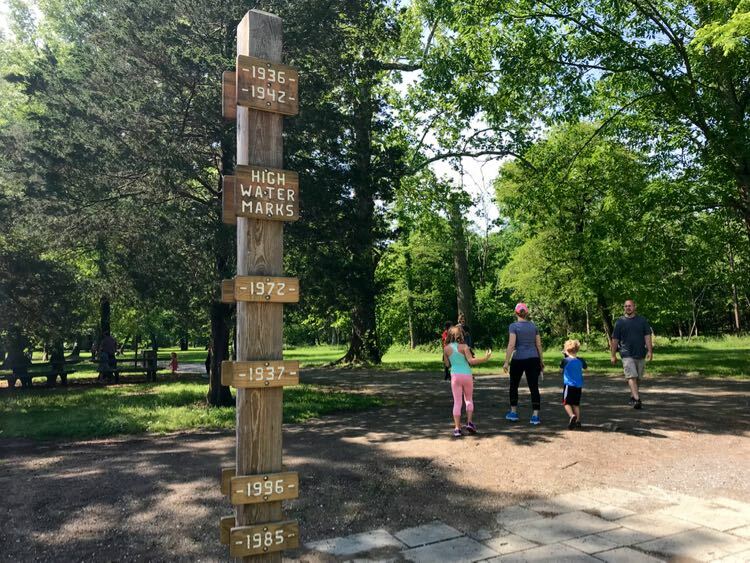 If you arrive and the line is long, consider heading to one of these alternate nearby Northern Virginia parks. 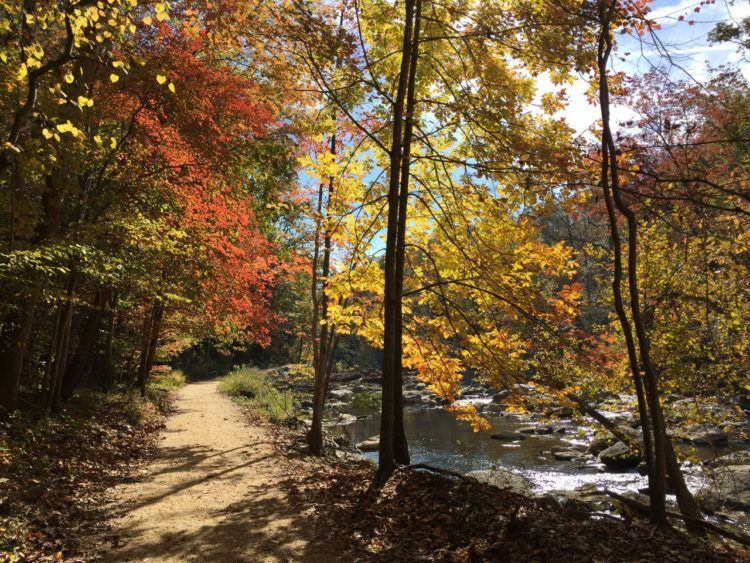 The River Trail is part of the Potomac Heritage National Scenic Trail, which offers many more great hikes in Northern Virginia and beyond. There are restrooms at the Visitor Center and, in season, near the start of the Matildaville Trail. Don’t have a car? 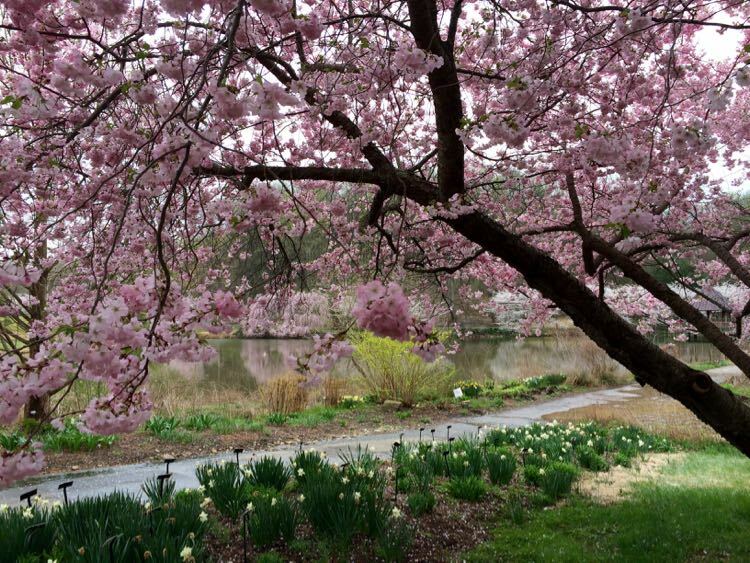 There is no public transportation to the park, but you can reserve a Zipcar at locations throughout Washington DC. 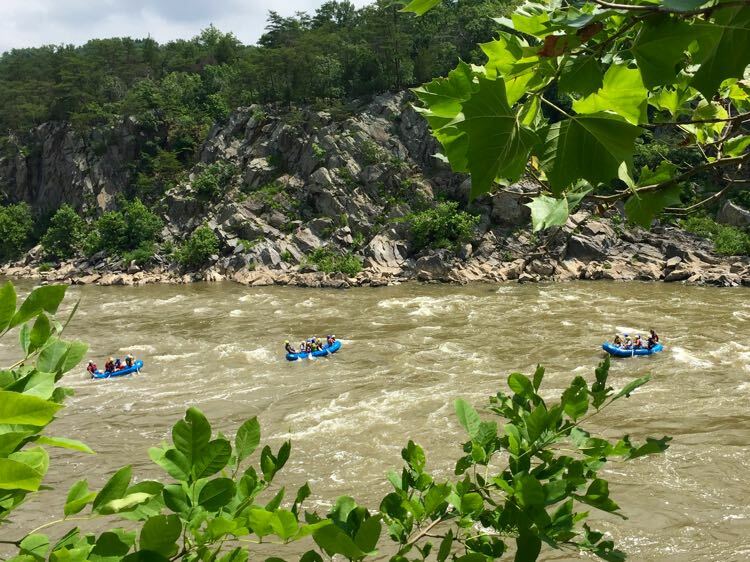 There is plenty of parking at Great Falls Park, but it does fill on busy weekends. 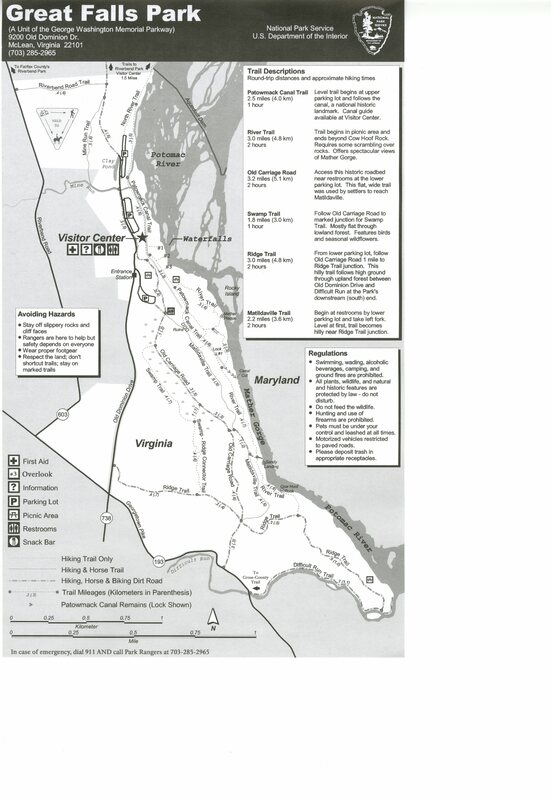 Download the Great Falls Park Trail Map. 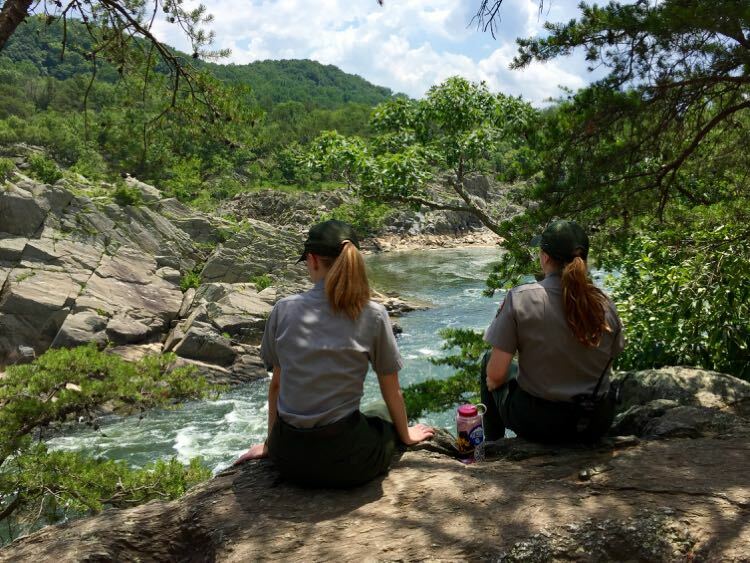 We hope you enjoy a River Trail hike at Great Falls Park on a beautiful Virginia day. 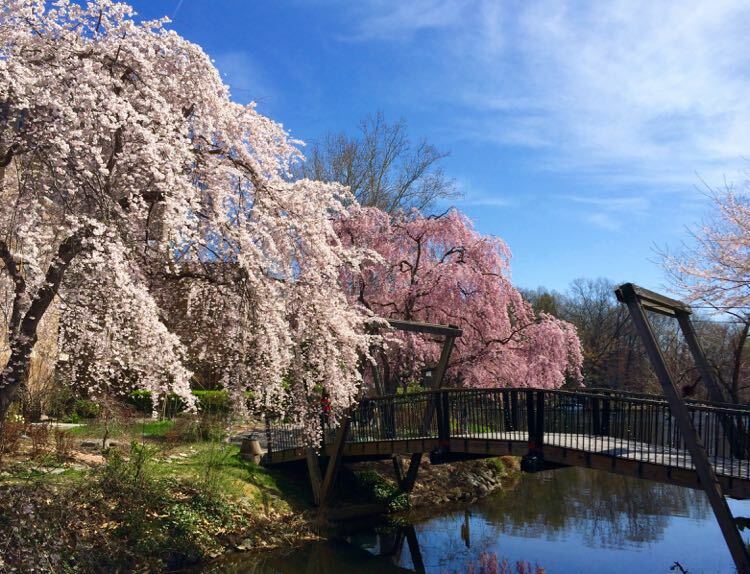 Great Falls Park is one of the places that remind us why we love living in Northern Virginia. 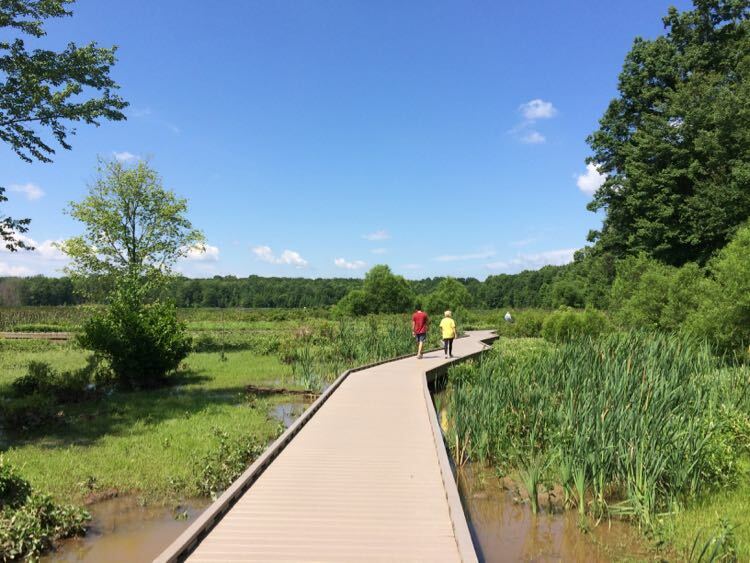 Since it’s only 18 miles from Washington DC, the River Trail hike is an excellent quick escape from the city. This article was published in March 2015 and updated in August 2018.